YANGON, Myanmar (AP) — Myanmar may have a new tallest mountain, though so far it seems quite happy with the old one. 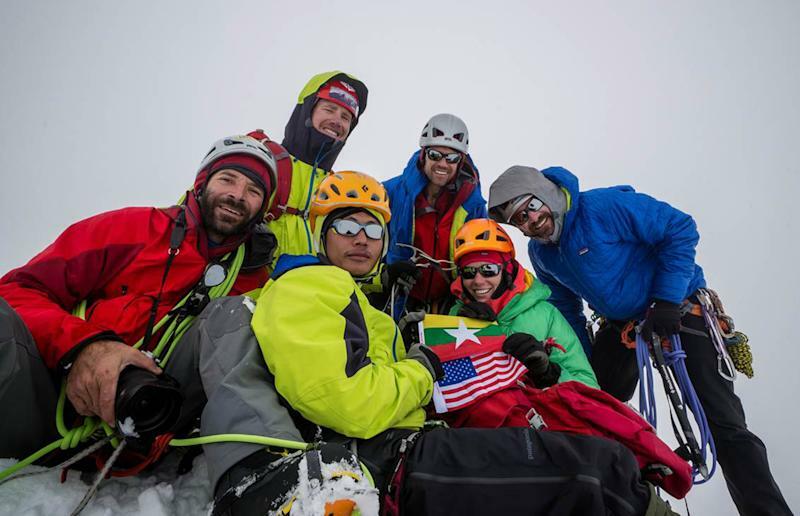 A U.S.-Myanmar mountaineering team trekked through jungles crawling with cobras, made a brief, illegal detour through Chinese-controlled Tibet and survived a terrifying 600-foot drop into a crevice on their way to the top of what has long been thought to be the country's second-highest peak, Mount Gamlang. Satellite and digital data, together with recent U.S., Russian and Chinese topographical maps, indicate it may be No. 1 after all, said Andy Tyson, leader of the team that climbed the snow-capped mountain along the eastern edge of the Himalayas in September. When Myanmar's peaks were surveyed in 1925, back when the area was part of the British Indian empire, Gamlang was measured at 5,834 meters (19,140 feet), behind Mount Hkakabo at 5,881 meters (19,295 feet). Tyson's team, equipped with a hand-held GPS device, measured Gamlang at 5,870 meters (19,258 feet). Tyson also said digital elevation data indicate that the British overestimated the height of Hkakabo, which may be less than 5,800 meters (19,029 feet). That would make Gamlang the tallest mountain in Southeast Asia, not just Myanmar. But the country appears cool to the idea of rewriting a key national statistic that schoolchildren have learned uninterrupted for nearly a century, through colonial rule, bloody military coups and self-imposed isolation. After Tyson and his team brought back the revised measurement of Gamlang, President Thein Sein wrote a letter congratulating them for scaling the "second-highest" peak. There were no stories in the local press. Geologists at the main university in Yangon were unaware. Students in Kachin state, home to both mountains, continue to be taught that Hkakabo is Myanmar's tallest, said Naw San, an elementary school geography teacher there. Myanmar, also known as Burma, missed many technological advances during 50 years of intellectual quarantine, and has been struggling to catch up since its military rulers stepped aside in favor of an elected government in 2011. Very few here know, for instance, that a man walked on the moon. "As it turns out, even the mountains are unknown, or perhaps just poorly mapped," said Tyson, of Victor, Idaho, a specialist in remote summit expeditions in the Himalayas, Antarctica and the Americas. "I definitely stand behind the statement that Hkakabo may not be the highest mountain in Southeast Asia, and our ascent of Gamlang is an important step to discovering the truth," he said. If Gamlang does turns out to be the highest peak in Myanmar, it could turn into another magnet for climbers and adventure-seekers, thanks to its beauty and unique terrain, Tyson and other mountaineers on his team said. The expedition took 35 days and — before even reaching basecamp — included nearly two weeks of trekking through hot and humid jungles. The mountaineers passed through one of the only known pygmy villages in Asia. They dodged cobras and vipers, and swatted away mosquitoes and sand flies at every turn. They also ate and slept in the homes of villagers — in some cases the chief himself — most of whom had never before seen white faces. "The route itself was very classic, Himalayan mountaineering," said Mark Fisher, also of Victor, Idaho. "Glacier travel, snow, ice, crevices, exposed ridgeline. A really aesthetic, enjoyable climb."